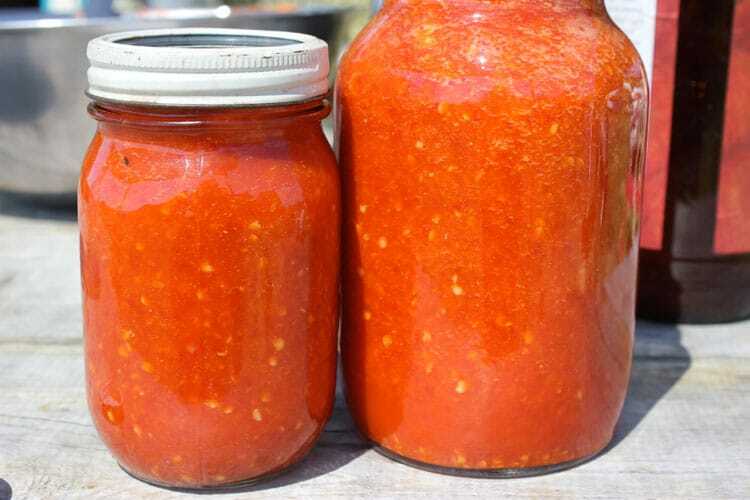 Imagine combining the spicy zing of your favorite Tobasco sauce with the complex flavors and live-culture, probiotic goodness of a lactic acid ferment, and you get this amazing homemade hot sauce – one that we make at the end of summer and enjoy all winter long. First, we start with ripe, fresh chiles. 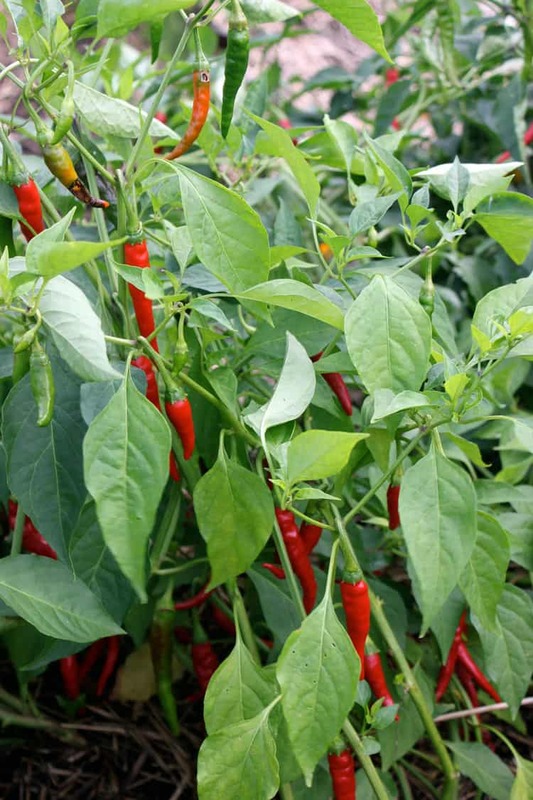 These are Long Thin Cayenne Peppers mixed with a few yellow hot peppers, but you could also use green chiles like seranos or jalapenos for a green hot sauce. 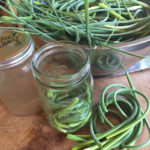 Cut off the stems and chop into a couple of pieces, and loosely pack into a mason jar. Mix a 5% brine (3 TBSP salt per quart water) in another container. Pour this over the chiles and cover with a cloth or a lid that is left slightly a jar. 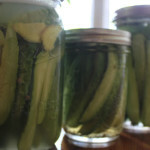 The technique is exactly like making naturally fermented pickles. I like to keep this jar on my counter where I will see it every day and remember to invert the jar 1 or 2 times per day to keep mold from forming on the surface. Alternatively, you could weigh down the peppers with a glass weight designed especially for fermenting. After a week or two, the liquid should be cloudy, the sign of lactic acid bacteria proliferating, and the ferment should taste delightfully sour/tart. 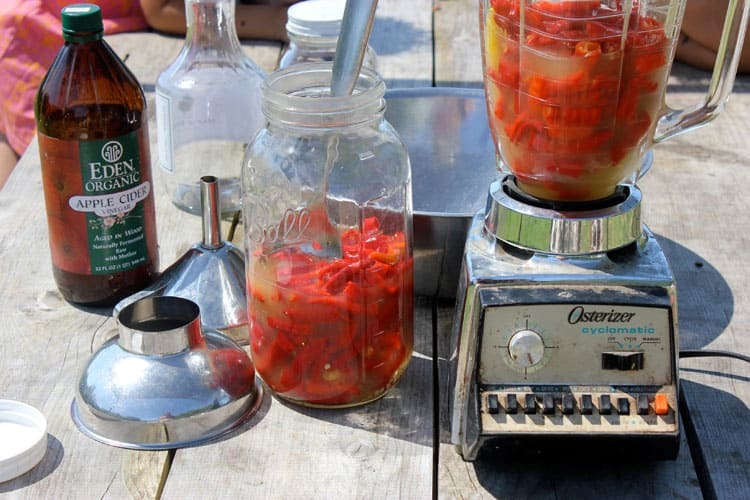 Now we’re ready to blend the peppers into your lacto-fermented hot sauce! 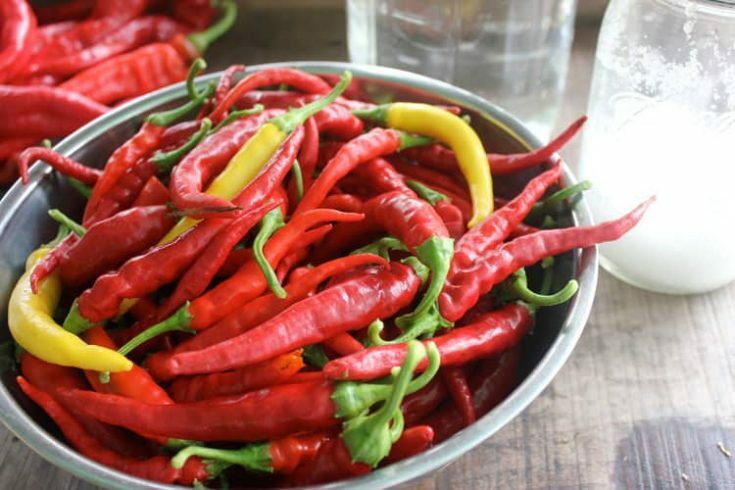 Carefully blend the chiles and brine into a velvety red puree. 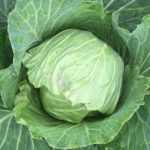 You might not need to add ALL the brine – start with a small amount and add to your desired consistency – more for a liquidy, Tobasco-like sauce, less for a thicker paste-like hot sauce. We usually add a few drizzles of apple cider vinegar, just to increase the acidity, which helps your homemade hot sauce keep longer. 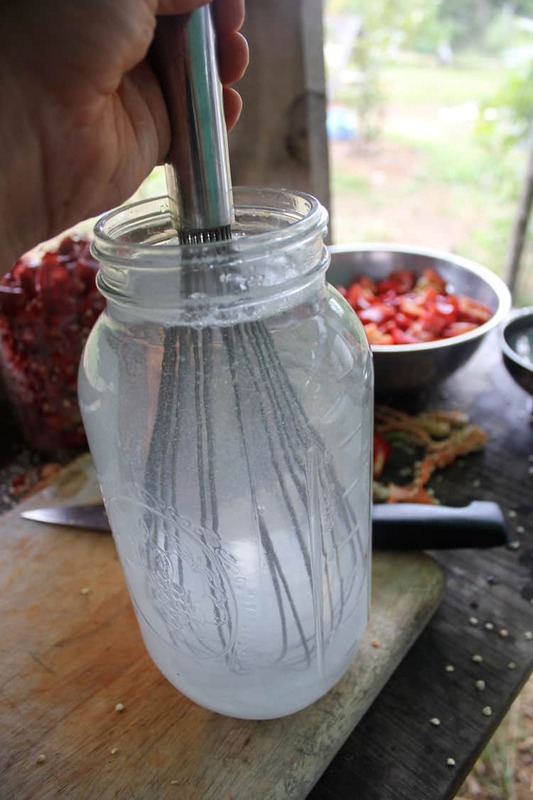 Store your homemade lacto-fermented hot sauce in a cool or refrigerated place, and enjoy a bit of summer heat all year long! 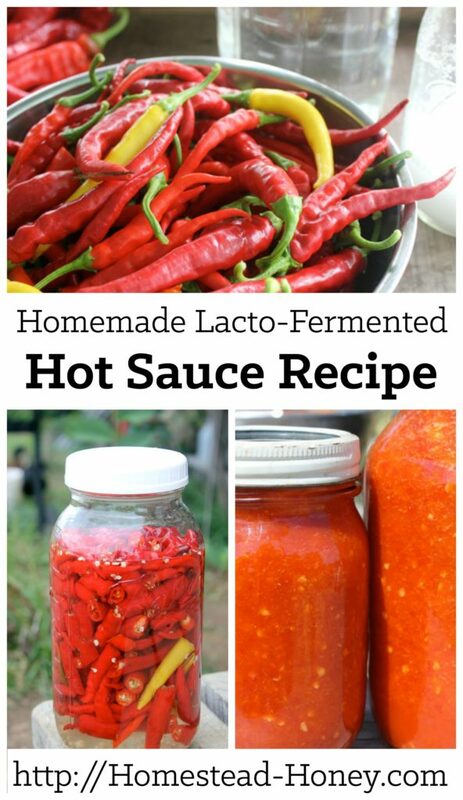 Capture the taste of summer with this Tabasco-style homemade lacto-fermented hot sauce recipe. 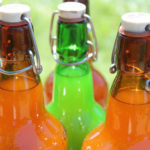 Your homemade hot sauce will taste better than store bought! 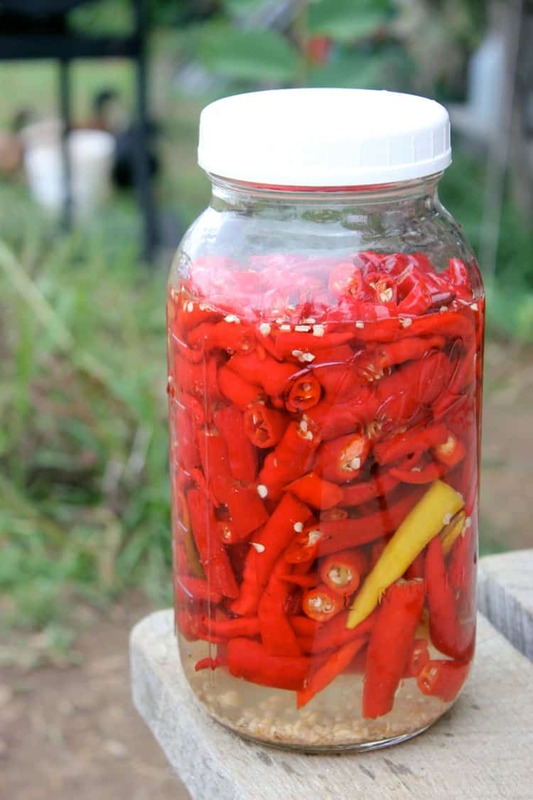 Cut the stems off the chillies and chop into a couple of pieces, and loosely pack into a mason jar. I like to keep this jar on my counter where I will see it every day and remember to invert the jar 1 or 2 times per day to keep mold from forming on the surface. 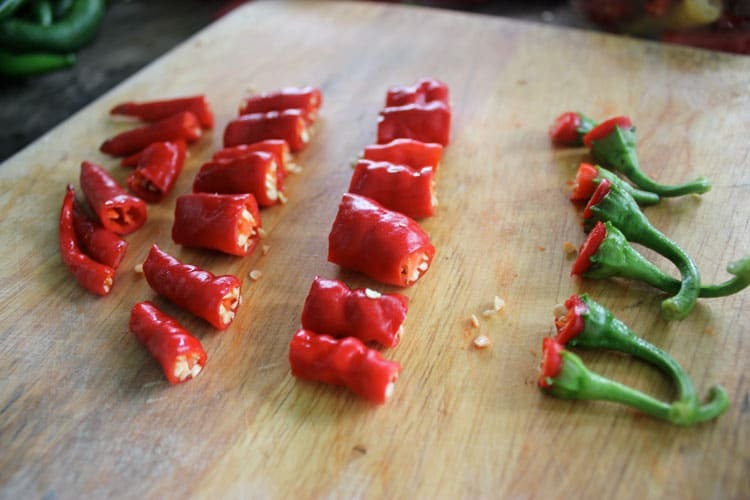 Alternatively, you could weigh down the peppers with a glass weight designed especially for fermenting. Carefully blend the chiles and brine into a velvety red puree. 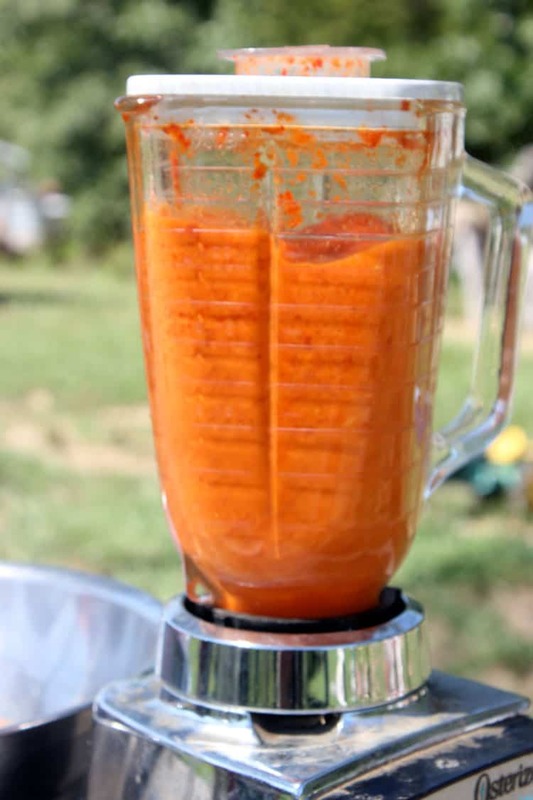 You might not need to add ALL the brine – start with a small amount and add to your desired consistency – more for a liquidy, Tobasco-like sauce, less for a thicker paste-like hot sauce. 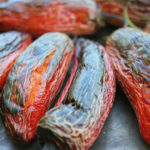 I used Cayenne Peppers mixed with a few yellow hot peppers, but you could also use green chiles like seranos or jalapenos for a green hot sauce. My husband tells me that hot sauces and ketchup were traditionally always fermented. It’s a great flavor! I have an abundance of hot peppers (chilis); definitely going to try this. Thanks for sharing. How long will this sauce typically keep if refrigerated? If you’ve ever had a batch “go bad”, what are the telltale signs? The obvious sign of a ferment gone bad would be surface mold. You can scrape this off the surface and continue to use the sauce if it’s not too nasty. I’m not sure if it’s the addition of the vinegar, or the spiciness, but we kept our hot sauce in a cool place, but not in a fridge, and it kept for months! We ran out before it showed any signs of mold. I find that my peppers grow best in nice rich soil, and of course they need a lot of sun. Good luck growing them! The primary reason ancient people drank fermented beverages, rather than plain water, was because nothing that can harm you survives in a fermented beverage. Granted, different wild yeasts and bacteria can cause different, (sometimes undesirable), flavors, but the end result is not harmful to your health, even if it tastes gross. The same will hold true for fermented hot sauce with vinegar added. 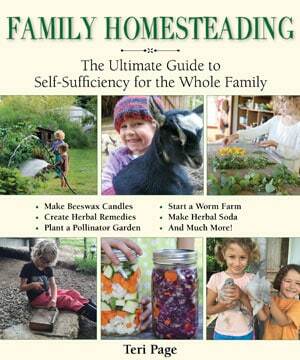 Your best bet for long term storage, (should you make enough), is to can the finished product. If vinegar is used, water bath canning will be sufficient, if no vinegar is used, pressure canning would be the way to go. Thirty five minutes, using either method. Good stuff. I do much the same, but blend with a mixture of vinegar and garlic for something more akin to sriracha. Could I put garlic cloves in with the peppers…. Absolutely! That would taste great! I have a batch of this started. I suppose I forgot about turning the jar upside down 1 or 2 times a day. Mold has formed on top. I scoop off all I can but in a short period of time it is back. Do I consider this batch ruined It does not have a foul odor. It should be fine, as long as it’s white mold, and not funky colors or funky smells. 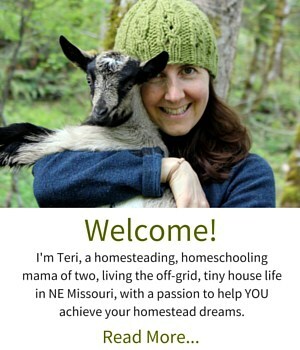 A few thoughts: 1) maybe mold spores are in your jar, so switch to a clean jar/lid. 2) Top off the jar with more brine to make sure it’s really full! 3) Add a bit more salt, or even a splash of vinegar to the solution. Good luck! Thanks for this recipe. We did this last year. I made two different batches, in half gallon jars, one with hotter peppers and one with milder ones. I ended up straining the seeds out of the hotter one and put it in the old Tobasco jar, mostly for my husband. We will do this again but we still have so much we might not need it until next year lol ! We still have two quart jars of fermented peppers left from last year as well!! Glad you enjoyed it! Jeff and I still talk about this hot sauce at least once a month. Well, truthfully, we talk about everything we experienced on that trip all the time. But we especially can’t wait to try our hands at this hot sauce. Thanks for posting the recipe! Oh, and tell Brian that he gave Jeff the bread making bug (I’m glad one of us caught a good bug)! He’s been making rolls and buns, and is going to start making pizza dough this weekend. Oh, that’s great! I’ll be sure to tell Brian. We’re still enjoying the hot sauce from last year and about to make some more!